Our team building sessions offer one of a kind, highly popular experiences that create laughter, fun and a unique experience that will be remembered around the office for a long time to come. Our facility can host up to 50 people per hour split among the six escape rooms we offer. Larger than 50? We have you covered, choose between the different packages below or call us directly to discuss our packages. Have fun and blow off some steam with our escape room experience. Take your team to the next level and bridge the gap between the experience and your team goals. The escape room experience will give companies the opportunity to practice and analyze their skills in communication, critical thinking, logic and organization, all in a high pressure- live situation environment. You will leave the challenge united and invigorated. Team building is paramount to the success of a business. 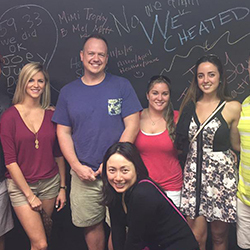 Escape rooms provide interactive challenges to strengthen your teams. We offer engaging events hosted by experts in fun. Our facility can host up to 50 people per hour split among the six escape rooms we offer. Larger than 50? We have you covered, call to discuss all options. Suitcase Game – Mobile game great for luncheons and teasers. 30 minutes of thrilling fun! And more! Each group is different and will bring different perspectives to the experience! Hosting an escape room team builder? Let us help with the details! We can recommend restaurants within walking distance, lodging and other downtown WPB attractions. We are experts in the field of FUN! Setup Your Group Event Now!